Outside of minivans, large three-row sport utilities and crossovers are the family vehicles of choice. None are more family friendly than the Toyota Highlander, which sees a significant refresh for the 2017 model year. The Highlander sits in the midsize three-row crossover segment with mid-range exterior appeal and a very ergonomic and well-done interior. The 2017 Toyota Highlander is a top pick for this three-row family segment because of that interior and the generally thoughtful design elements that go into the Highlander overall. Small touches make everyday uses, such as grocery grabbing, kid wrangling and weekend getaways, easier. For the 2017 model year, the Highlander's mid-cycle refresh includes some exterior styling updates, a new V6 engine, new safety technology and a new SE trim level. These changes build on the Highlander's already well-deserved reputation for excellence. The 2017 Highlander sees some exterior updates compared to last year, most of which focus on the front fascia and rear tail lamps. The contemporary looks of the Highlander have been upgraded this year with a more aggressive grille, which is now slotted rather than open. Those slots extend the grille down to the lower intake and nearly delete the bumper on the fascia, giving the Highlander a bigger-looking front end without making it sinister. The rest of the Highlander is much the same as it has been for this generation, with a sleek look across the door panels and a slightly sloped but otherwise refined roofline. An upward stroke at the bottom and a slight upward tilt to the beltline just before the rear door finish make for some forward movement to the Highlander. At the rear, LED tail lamps give a more sophisticated look to the tail, emphasizing the rounded hatch and curved window within it. The rear bumper remains large and protective and with all V6 models now having towing as standard, the prominence of the hitch receiver gives the 2017 Highlander a stronger emphasis. The 2017 Toyota Highlander Hybrid model mirrors these changes with only some slight decor changes to note its hybrid status. These include a blue background to the Toyota emblem and a couple of hybrid badges on either side, as well as one on the rear. There are few choices that can seriously compete with the excellent ergonomics of the 2017 Toyota Highlander's interior. 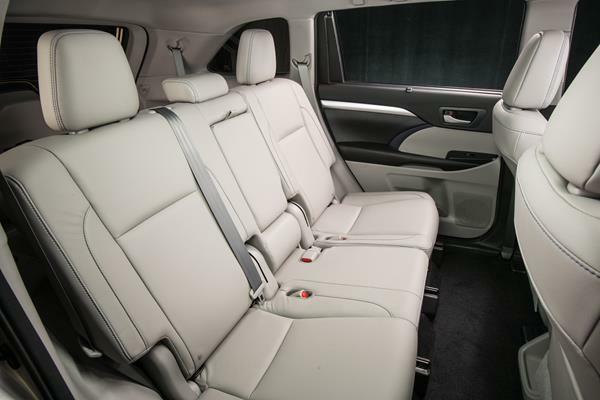 The general design theme of the 2017 Highlander's interior is its functional ergonomics and quality of workmanship. Entry and egress for the driver and front passenger are good, with low door sills and tall openings aiding an easier step-in. The second row is also easy-access for the same reasons. The third row requires a little more effort, but is mainly designed for children and teenagers, so their access is not terribly limited. For the front seats, the driver and passenger will find that cubbies, nooks, storage bins and thoughtful charging cord pass-throughs are all extremely handy. Multiple gadgets, such as phones, tablets, etc., are accommodated by the dashboard's lower shelf and the little divider to hold the driver's phone in place has a convenient pass-through slot, so a charging or plug-in cord doesn't have to loop around the outer dash. The shelf widens at its center, near the passenger, to accommodate a tablet as well. For the driver, instruments are all nicely laid out, though reaching some items on the center console (stereo and infotainment) will likely require the driver to lean forward. Seat adjustments make seeing the instrument cluster and reaching controls for the vehicle itself easy and the driver's position is high and commanding. In the second row, plugs for devices and places to put them are a bit more limited. Most of the Highlander's trim packages include two USB ports at the rear, and the captain's chairs (versus a bench) offer a flip-up storage tray for drinks and gadgets. The optional rear seat entertainment system is nicely done and includes wireless headphones and a remote, as well as plenty of plugs for various devices to use the displays. The third row is large enough for average adults, but not as comfortable as elsewhere in the cabin. Kids in boosters up to teenage years will do well back there, and up to three can sit across when required. Access is a bit limited as the second row seats do not fold forward all the way, but the wide second row doors help make up for that. Cargo space is good at 14 cubic feet with the third row up and 83.7 cubes with the second and third rows folded down. They fold flat, leaving a very usable space with plenty of built-in tie-downs to boot. The hatch's opening is wide and square and the ability to open the window only is a boon for loading groceries and other items that are best packed against the tailgate for transit. Small grocery bag hooks at the very rear are also a nice touch. 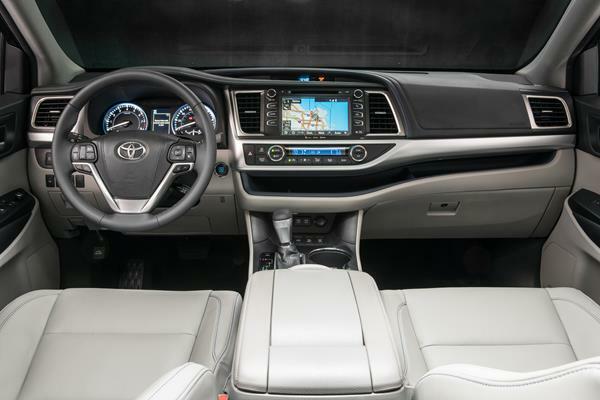 A 6.1-inch touchscreen is standard in the 2017 Toyota Highlander and includes basic Bluetooth connectivity. Most trims have an 8-inch infotainment screen with a larger Entune suite, which is a better-sized screen for the larger Highlander's interior. The Entune App Suite is available for most Highlander models and adds smartphone integration through the Entune app. We like the Entune app for its ease of use, clear screen and menus, and simple design. That has limitations, though, and the integration via the smartphone app is often clunky and iffy in execution. Other manufacturers have been moving towards built-in apps that utilize Apple CarPlay and Android Auto as their interface for smartphone add-ons usually run better. Fuel efficiency has generally been a strong suit for the Highlander and it's been improved somewhat for the 2017 model year. The base engine, available only in the base Highlander package, is a 2.7-liter 4-cylinder that is EPA-rated at 20 mpg in the city and 24 mpg on the highway. This is commensurate with other 4-cylinder options in this segment. The V6 is all-new this year, upgrading from the previous 4.0-liter to a smaller, but more powerful 3.5-liter that is rated at 19 mpg in the city and 26 mpg on the highway with all-wheel drive. The front-wheel drive powertrain option ups MPG numbers to 21 city and 27 highway. 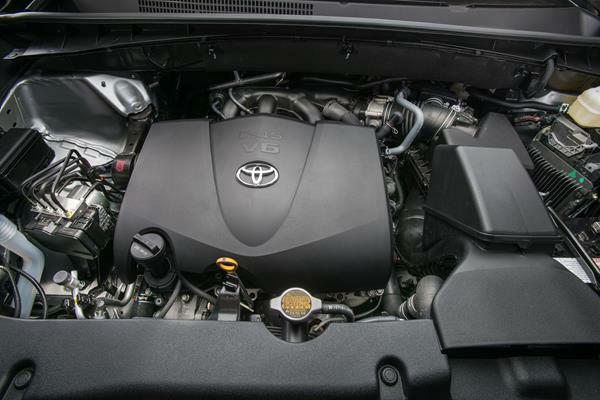 This same engine debuted last year in the Toyota Tacoma. These V6 numbers are better than average for the midsize crossover segment. Fuel economy numbers for the 2017 Highlander Hybrid model are similar to last year, at 30 mpg in the city and 28 mpg on the highway. 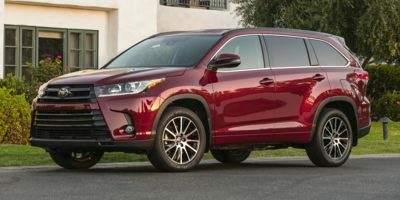 The "Better Than Most" rating for the 2017 Toyota Highlander is a continuation of three years of that same rating from the J.D. Power and Associates Vehicle Dependability Study. That speaks volumes for the Highlander's current-generation build. One safety recall has been issued for the spare tire, which is not a reliability concern for the mechanical Highlander. The 2017 Toyota Highlander is also continuing the model's legacy of having a near-perfect safety record. The crash test results published for the 2017 Highlander have it receiving top marks from both the National Highway Traffic Safety Administration and the Insurance Institute for Highway Safety. 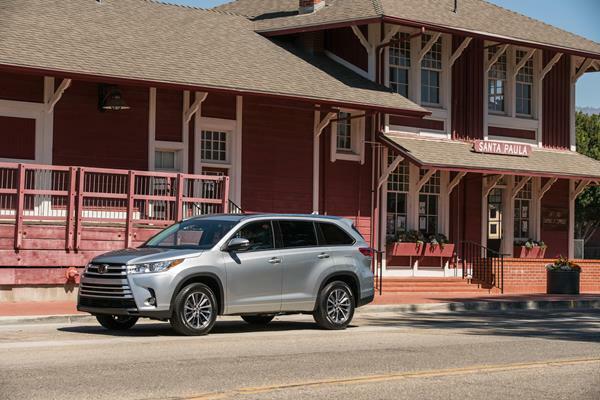 This year, Toyota added its Safety Sense technology suite to the Highlander as standard equipment across all trim levels. The base level Highlander has a 2.7-liter 4-cylinder engine and 6-speed automatic transmission. 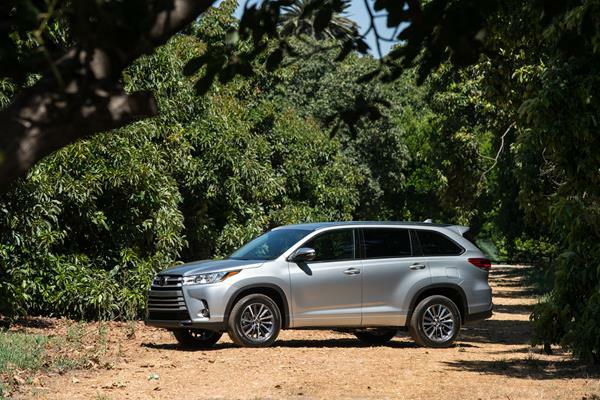 This engine's 185-horsepower output is less than interesting and gives a sluggish feel to the large Highlander. Most will choose this engine for fuel economy or as a base model purchase for a fleet. Optional on the base model and standard on all other trims is the much more potent 3.5-liter V6 that replaces the outgoing 4.0L V6. The new 3.5 debuted in last year's Tacoma model and produces 295 horsepower through an 8-speed automatic transmission. The transmission is improved for the new engine and the HP output is about 25 more than the previous V6. Fuel economy remains good, despite the power boost. The new V6 gives the Highlander a much more potent feel with a lot of confidence for acceleration and passing. 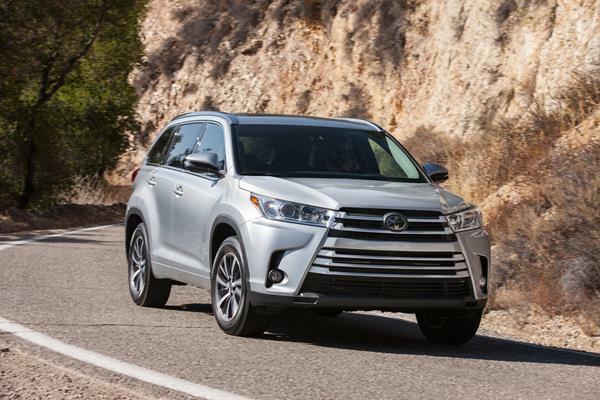 The handling characteristics of the 2017 Highlander are matched to the engine's muscular output, giving the crossover a smart feel in the turn and on the highway. Steering is just about right, giving good feedback without being too stiff. Off the road, the Highlander is capable of most light-duty and some medium-duty terrain maneuvering. Enough so that most family outings into nature will be accommodated easily. The Highlander Hybrid model is similar to last year's and continues to be an excellent choice for performance, as well as fuel efficiency. Its performance is very similar to the V6 gasoline models in terms of get-up and go, acceleration and off-pavement prowess. The 2017 Highlander is relatively expensive for the market, but the vehicle continues a growing sales trend despite that. The Highlander is generally in the top three vehicles in the midsize SUV market for sales. The Highlander's base (LE trim) price is typical for the class, but includes the under-performing 4-cylinder. Most buyers are into the mid-range with the XE Plus and XLE models. These are well-priced for the package options in the $35,000 to $40,000 range. We recommend these two trims for their value packaging. More upscale buyers will be interested in the Limited and Platinum trims, which are expensive, but fully loaded with gadgets and goodies. Buyers can get into one of those trims for $45,000 or so. 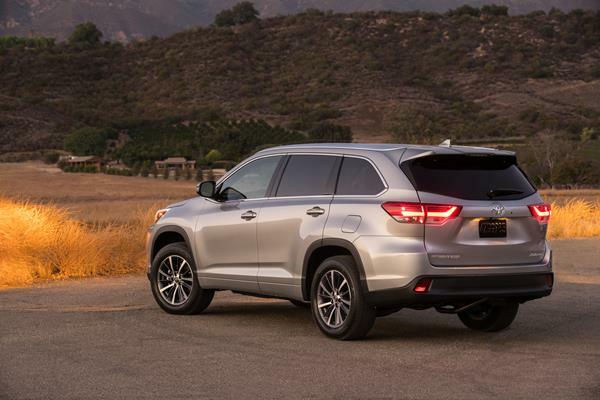 Traditionally, Toyota vehicles have a slightly higher resale value than market and the Highlander is no exception. Competition in the midsize three-row segment is stiff. We recommend shopping the 2017 Highlander against the Kia Sorento, Honda Pilot and Ford Explorer. All three are competitive against the Highlander for different reasons. The Sorento is similarly well-designed and fuel efficient at a lower price point. The Pilot is more contemporary with a similar family-friendly appeal and high value point. The Explorer is more robust and powerful with a similar MPG rating and excellent interior. For those looking at the higher-end Highlander trims, we also recommend cross-shopping the GMC Acadia for its value versus bling. The 2017 Toyota Highlander is an excellent vehicle and possibly the most family-friendly midsize crossover on the market today. The Hybrid model has a modest price uptick for the hybrid-electric powertrain, but returns impressive fuel efficiency without sacrificing performance. Whatever Highlander you choose, your family will be well served. Interested to see how the 2017 Toyota Highlander ranks against similar cars in terms of key attributes? Here are the 2017 Toyota Highlander rankings for MPG, horsepower, torque, leg room, head room, shoulder room, hip room and so forth.